In a recent survey of 2,000 U.S. and U.K. workers, we learned that 76% of employees don’t trust bosses who fail to share company data. By withholding information, managers are not only leaving employees to fly blind to company performance, but also making it difficult for them to anticipate problems, make informed decisions, and remain productive. 10% of employees are aware of company progress in real time. Most of those who do receive company data only see it once a month. However, more than 15% never see any company performance data. While this approach, commonly referred to as Mushroom Management, may seem outdated to many, it continues to raise concerns in many offices. In other words, employees are continuing to receive work without knowing its purpose. And as a result, they’re not motivated to stick around, let alone be advocates or generate business value. What Happens When You Don’t Share Data With Your Team? You can read all the modern business books in the world, but they’re all going to tell you that a team needs confidence in their leader to be driven and motivated. Research shows that over 75% of employees lost confidence in their bosses when they failed to share company performance information. 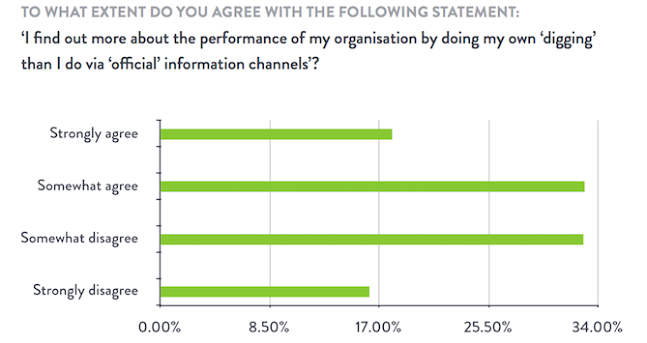 More than half admitted that they take it upon themselves to find out the company data most important to them. In order for employees to trust their leaders, they need to feel trusted and empowered. When they don’t, they often lack empathy when engaging with customers or meeting new prospects, and typically struggle to accomplish their day-to-day tasks. It’s also not uncommon for them to begin making assumptions about the company and its performance that are likely untrue. This is dangerous territory. When you create a culture that lacks trust, you create a strained and hostile environment. And you’re certainly not going to attract top performers with that approach. The lesson? Don’t waste the effort you’ve put into recruiting smart people. Members of your team offer a fresh perspective and will have ideas to improve the company’s bottom line that you may have overlooked. But they’re only going to feel empowered to bring these ideas to you if they’re given the information they need to understand what’s happening with the company. Employees who know and understand their company’s target metrics are able to generate better ideas, test possible solutions, and actively solve issues together. It’s important to share the information that has the greatest impact on the business with your entire team, as well as how each team member or department impacts that performance. First, you need to know what your company is working towards. Start by defining your company goals and assigning KPIs (key performance indicators) to each. For example, if your quarterly goal is to grow revenue 5% month over month, your KPIs could be user growth, decreased churn, upgrades, trial conversions, and so on. Next, define how each department will help reach those goals with their own KPIs. The KPIs for your marketing team could be website visits, blog conversions, webinar sign-ups, social growth, or social ad conversions. Many companies will make department-specific metrics available to the entire team to add a layer of transparency and build an environment of teamwork. It’s crucial, however, to keep the overarching business metrics front and centre for everyone to see, which I’ll cover in the next tip. Delivery of company KPIs is equally as important as the data itself. 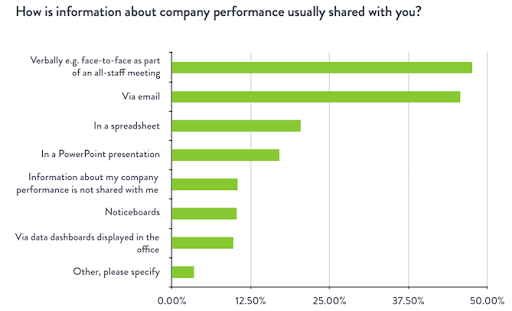 A recent survey’s respondents indicated that when their companies do actually share data with them, they do so ineffectively, often via email or spreadsheets. This almost guarantees your employees won’t take action on the data shared with them. Your team’s inboxes are crowded, and spreadsheets contain huge volumes of data — meaning your business’s most important metrics will be missed. To combat this, make sure the KPIs you’re sharing are simple and consistent. In other words, your metrics need to be actionable. Create a dashboard. If your team has a line graph in front of them visualizing weekly revenue vs. target, they’ll understand the health of the business and what needs to be done to reach your goals. If you build a simple company dashboard and make it easily accessible to everybody, every team member will always know how the team is doing. Ultimately, this means less time spent answering questions, and more opportunity for employees to take action to keep the numbers up. 3) Keep your KPI visualisations simple. As I mentioned above, how you display data matters a lot. When designing your dashboard or deciding what metrics to share with the team, keep your KPIs and visualizations simple and consistent. Your team should be able to glance at the dashboard, understand what the numbers mean, and quickly identify what problem or opportunity needs to be acted on. We can learn how to effectively present complex information by looking at studies of how the brain consumes data. For example, in Western culture we read left to right. This means that the most important piece of information should be in the top left corner. The way you use colour is important, too. It’s one of the most powerful tools to convey information because of its subconscious attribute. Our brains assign significance to colour quickly, without conscious thought. Make a number green and we immediately know that metric is traveling in the right direction, whereas red signifies danger, and therefore attracts the user’s attention. The less a person has to think about what they’re being shown, the better. So keep visuals clear and accurate. As Stephen Fewsaid, “Dashboards are not an appropriate venue for artistic impression.” Anything that detracts from the metrics themselves should be stripped away from the dashboard. That way, your team can focus on what’s important: the numbers and what they mean for your business. Of the survey respondents, 50% said that bosses sharing information and data had a significantly positive impact on productivity and motivation. The benefits of data availability will far outweigh the investment needed to begin measuring. You’ll not only create a culture of transparency and openness, you’ll have a motivated team working towards the same goals and taking action to do what’s best for the company’s success. Sounds pretty great, right? Objective can’t take credit for this blog… many thanks to Feedly for this extremely useful blog content. What Objective can take credit for is building dashboards and developing KPI reports.